If you would like your Race team to be profiled, please download and fill out the Team of the Week form. Pace University has had a Race team since 2004. It was founded by Ellen Mandel, PhD. A long-time supporter of Komen Greater NYC, she has served as Race Hospital Chair for several years. 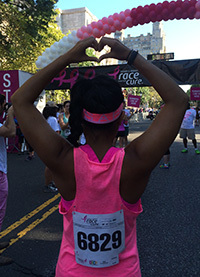 Mandel created the team to increase Pace’s support for the Race, as well as to bring together students, faculty and staff – from both the university’s New York City and Pleasantville campuses – to fight breast cancer. Last year, the team had 135 members and raised $4,111. Mandel, a professor in the Media, Communications and Visual Arts Department, is the team captain. For the past three years, Pace senior Elissa Casa has served as “assistant captain,” assisting Mandel with team administration and preparation. Team members include students, faculty and staff along with their families and friends. The team recruits new members starting in the spring, when emails go out to potential participants informing them about when registration will begin. Throughout the summer, Mandel and Casa follow up with past team members, as well as students, faculty and staff who have participated in other fundraisers on and off campus. Fliers and posters are displayed around the New York City and Pleasantville campuses from early summer until the weekend of the Race.